If you can not attend a direct Reiki course for any reason, then this course may be a great alternative for you! Hello and welcome to Reiki level 1! My name is Lina, you may think I'm a young Reiki teacher, but I've practiced Reiki since I was 3 years old, and my mother attuned me when I was just 6! Reiki has been part of my life ever since then and has helped me a lot growing up. When I was 18 I did my Reiki masters. I was very passionate in practicing Reiki, and now I'm also ready to teach it. Together with my mom we created this course for you. Hi, my name is Daniela, and I have taught Reiki since 2002 when we lived in Germany. 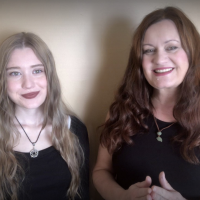 I am so excited to do this course for you, together with my daughter Lina, who will also give you the Distance Attunements for Reiki Level 1.
we will guarantee you , that you will get four attunments for your Reiki level one. This course provides you with reading material and demonstration videos on how to give Reiki to yourself and others. I, Lina, will personally do the distance attunements for you. Do Distance Attunements actually work? A Distance Attunement works on the same principle like the Distance Healing method, that you can learn in Reiki Level 2. The Master/Teacher uses Reiki Symbols to connect with the student on an energetic level, and does the attunements the same way as if the student would be in front of the teacher. Based on experience and feedback, there is no difference between receiving attunements in person or from the distance. But still, it is important to know that just receiving the attunements is not enough. Important is to learn the knowledge and principles of Reiki, and to practice on yourself first, before you start to work with others. Also that distance attunements enable you to practice Reiki, you should make the effort and commitment to go through all the information provided in the course to ensure that you are working in accordance with the principles and methods of Reiki. If you are a motivated individual then you can become a competent Reiki Practitioner after receiving the distance attunements. This course teaches you everything that we would teach in person. Do you get an certificate? At the end you will get a certificate for Reiki level one. This certificate will be send per e-mail as a pdf-file after the attunements. Very simple, enrol the course now, download the material, watch the movies, and get in contact with us for your personal attunements. More about it will be explained in the course. How does an Attunement feel like? What else can you do with Reiki? Lina is a Reiki Master,Teacher, and she practices Reiki since she was 3 years old! Lina is a Theta Healing Practitioner, and does intuitive Angel Readings. Daniela teaches Reiki since 2002. She also practices and teaches lots of other healing modalities. She does Non-hypnotic Past Life Regressions, Shamanic Healing, Mediumship, Space Clearing, Trance Healing, and she is the Founder of the WhiteLight Self Empowerment System and the Healinggrid-System.